SUMMARY: Health and wellness coaching services allow payors, employers and even healthcare providers the chance to engage individuals in self-management of chronic illness, reducing healthcare spend and improving health outcomes and productivity in the process. 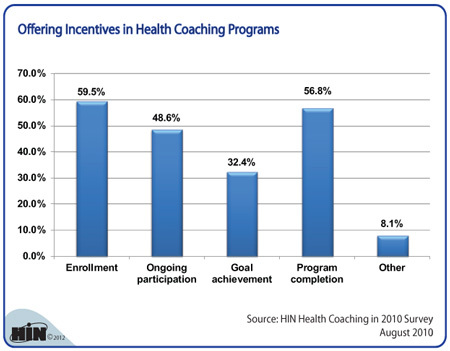 We wanted to see for which actions incentives are offered in health coaching programs. Download the executive summary of Health Coaching Benchmarks, Third Edition. Health Coaching Benchmarks, Third Edition is designed to meet business and planning needs of employers, health plans, physician practices and others by providing critical benchmarks that show how health coaching is impacting health outcomes, healthcare spend and self-management of chronic illness. In addition, this third annual collection of data points on health and wellness coaching presents actionable new data on health coaching activity, with the latest metrics on the prevalence of health coaching, favored delivery methods, targeted populations and much more. Health Coaching Benchmarks, Third Edition is available from the Healthcare Intelligence Network for $127 by visiting our Online Bookstore or by calling toll-free (888) 446-3530.